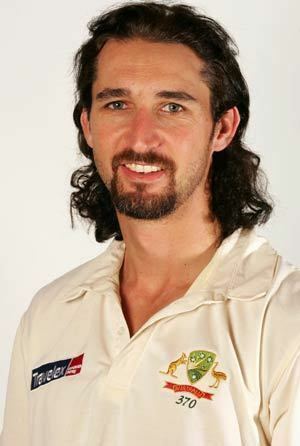 Jason Neil Gillespie (born 19 April 1975) is a former Australian cricketer who played all three formats of the game. Primarily a right-arm fast bowler, but he was also a competent lower-order batsman with a Test double century, an unbeaten 201. 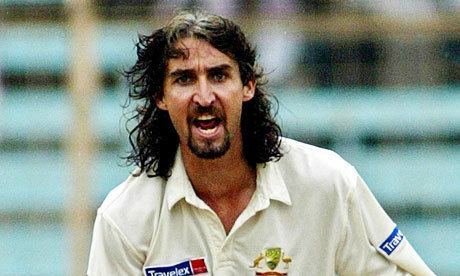 Gillespie made his Test debut against the West Indies at Sydney in 1996 and his One Day International debut against Sri Lanka at Colombo in the Singer World Series in 1996. He played for South Australia, Yorkshire and Glamorgan at first-class level. He was an AIS Australian Cricket Academy scholarship holder in 1995. On 29 February 2008, Gillespie announced his retirement from first-class cricket in Australia and then played for a period in the unauthorised Indian Cricket League for the Ahmedabad Rockets. At the end of the 2008 English domestic season he retired from all first-class cricket. As Yorkshire County Cricket Club's first team coach from 2012 to 2016, he guided them to two County Championship titles. Gillespie is an ethical vegan. 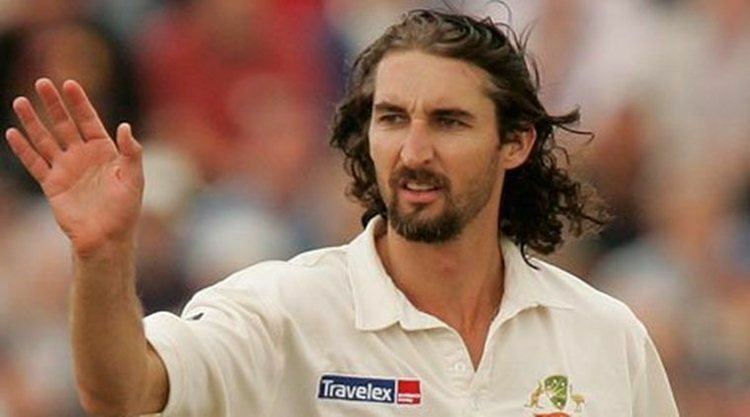 Jason Gillespie is a descendant on his father's side of the Kamilaroi people of Indigenous Australians, and is the first acknowledged Aboriginal person to become a Test cricketer. His mother has Greek heritage and Jason is the eldest of the five children. He attended Cabra Dominican College in Adelaide, South Australia. Gillespie married Anna (née McEvoy) in 2003. The couple have four children: Jackson (born February 2006), Brandon (born October 2007) Kingston (birthdate unknown) and daughters, Delaney, born November 2012 in Yorkshire. Gillespie has another daughter, Sapphire (born March 1995) from a previous relationship. Gillespie made his first domestic first-class century exactly a year later on his 32nd birthday in a County Championship match versus Surrey at The Oval whilst playing for Yorkshire. He hit an unbeaten 123 and in doing so, alongside Tim Bresnan, set a record ninth-wicket partnership for Yorkshire. The pair put on 246 before Bresnan was stumped off the bowling of Nayan Doshi. Gillespie's 123 not out was also the highest score for Yorkshire by a number 10 batsman. Gillespie made his first Australian domestic century in a Pura Cup match in the 2007/08 season against Tasmania. He put on a 250-run partnership with the South Australian wicketkeeper Graham Manou, who made 190. Gillespie remained 118 not out when the innings came to a close. Gillespie took 259 wickets in 71 Tests (at an average of 26.13) making him Australia's sixth-highest wicket-taker and giving him the 14th best bowling average for Australian bowlers who have taken more than a hundred wickets. In terms of pace, he bowled in the mid-140s–150 km/h mark in his early career up to about 2001. When he made his comeback in the 2000/01 season, he bowled more consistently, but at a speed of about mid-130s–low 140s in terms of kilometres per hour. Consistent injuries forced Gillespie to operate from a shorter run-up and therefore reduce his pace. Gillespie seldom dominated a Test series (the most wickets he took in a series is 20), but he was a reliable support bowler over several years for his more famous teammates Glenn McGrath and Shane Warne. However, Gillespie's career suffered an unexpectedly sharp decline. In early 2005, there were some signs that he was struggling, with somewhat poor displays against New Zealand, but he was still considered Australia's leading fast-bowling partner for McGrath. This poor form continued into the 2005 Ashes series where he struggled badly, taking just three wickets at a cost of 300 runs and, as a result, was dropped after the third Test. After the Ashes series Gillespie took 40 wickets for South Australia during the 2005/06 Pura Cup Season. He was the fourth-highest wicket taker in the competition, with an average (21.27) far below the other leading wicket takers. His best figures came against Victoria where he took 7-35. These performances saw him make a return to the Australian Test side against Bangladesh after injury problems to the first choice attack. Gillespie was named man of the series after taking 8 wickets and making a double century in the two Tests but was never selected to play for Australia again. Gillespie occasionally proved his worth with the bat, with a highest Test score of 201 not out and an average of 18.73. He is the only player in Test cricket with a career batting average of less than 20 to reach 200 runs in an innings. He demonstrated a solid defensive game, known amongst teammates as 'The Walking Forward Defence', and despite not regularly making big scores, he was a difficult batsman to dismiss and occupied the crease for substantial periods of time, allowing his batting partner time to get a big score. Also, given his low back lift, he could defend or deflect shots from spin bowlers more readily. He has a one-day international high score of 44 not out and he averages 12.56 in one-day internationals with a strike rate of 78.53. In the second Test match against Bangladesh at Chittagong on 19 April 2006, Gillespie (201 not out) set the world record (on his 31st birthday) for the highest individual score by a night watchman. This was Gillespie's maiden first-class century. Gillespie also shared a 4th wicket partnership of 320 runs with Michael Hussey. Gillespie was awarded man-of-the-match honours for his double-century in the first innings, and he was also named man of the series for his efforts that included eight wickets, at an average of 11.25, across the two Tests. It was his final match in international cricket. Gillespie is the only night watchman to score a double century in an innings of a Test. Throughout his career, Gillespie had bad luck with injuries, suffering from foot injuries, stress fractures in the back, hip twinges, side-strains, shoulders, torn calves, aching hamstrings, groin complaints and a broken right leg. He played only 52 from a possible 92 Tests following his debut to his axing during the 2005 Ashes series. Despite these problems, he was both accurate and economical. 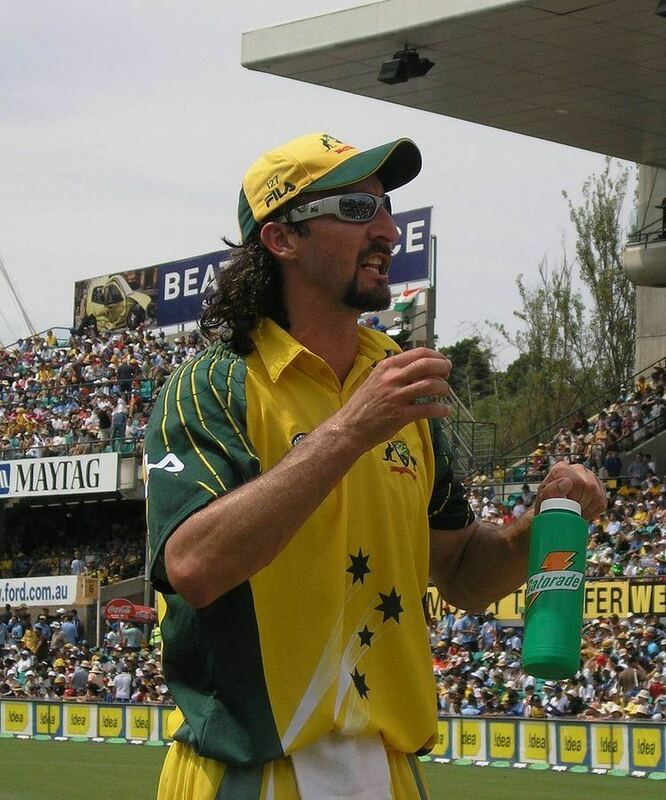 In Australia's 1999 tour of Sri Lanka, he was involved in a sickening outfield collision when both he and Steve Waugh were running to take a catch. Waugh was running from the infield towards the outfield, while Gillespie was running in. Waugh dived for the ball resulting in his nose and Gillespie's right leg being broken. The catch was not taken. Gillespie became a coach in Zimbabwe in August 2010. He worked primarily with the MidWest Rhinos, but he is also working on "grass roots" activities to improve the performance of young players in Zimbabwe. Gillespie was drafted in as the bowling coach of IPL's team Kings XI Punjab after their opening match against Pune Warriors in April 2011. In November 2011, he was named first-team coach of Yorkshire after a shake up in the club's coaching system. In his first season with Yorkshire, they were promoted from division two of the county championship; in the second, they were runners-up in the first division; and they won the title in 2014 and 2015, when he was one of the candidates to coach England. He returned to Australia after Yorkshire narrowly missed out on a third successive title in 2016. In April 2015 Gillespie was named as the coach of the Adelaide Strikers team in the Big Bash League. Gillespie has criticised dairy farming and the use of leather balls. While coaching Yorkshire, the club was sponsored by a dairy, about which Gillespie said: "Yes, they are a sponsor but it doesn't mean I agree with what they do. It's out of my control, just like the fact that cricket balls are made of leather". In July 2017, Gillepsie was appointed as the interim head coach for the Papua New Guinea national team replacing former New Zealand Test player, Dipak Patel.